The last update of the Global Poker Index (GPI) has revealed that Dominik Panka occupies temporarily the title of Player of The year. Its an unbelievable ascent. 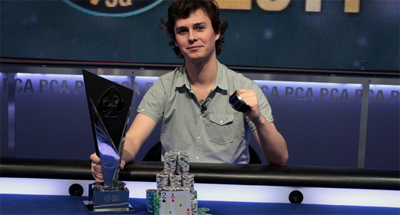 This Polish pro of poker has won 10 well-earned places. In fact, throughout the two first months of the year 2014, Panka has realized two great achievements, namely a victory in the High Roller tournament of the European Poker Tour and another one in the Main Event of the Pokerstars Caribbean Adventure. These two triumphs have awarded him a total gain of $1.8 million. Dan Smith follows him in the second position. He has also registered a spectacular progress after finishing runner-up in the Challenge poker tournament at $25,000 of the Aussie Millions. Vanessa Selbst has thus lost her place of honor and is currently occupying the third position. Four poker players have also joined the top 10 of the ranking Player of The Year, namely Mustapha Kanit (5th), Marvin Rettenmaier (6th), Marcin Wydrowski (9th) and Isaac Baron (10th). Mike McDonald and Ole Schemion have both lost 4 places and occupy respectively the 7th and 8th position. Concerning the classification top 300 GPI, Ole Schemion is at the top of the list, followed by Daniel Negreanu in the second position, and Marvin Rettenmaier in the third position. Its important to mention that none of the members of the top 10 is present in Melbourne to take part in the Aussie Millions. At the end of this poker festival thus, the ranking could know some changes. Concerning the newcomers in the GPI, they are 8 including James Collopy, John Racener and Alexander Kravchenko.